With more and more documents being produced every day, a reliable converter has become a necessity. A few months ago we introduced our new cloud-based converter software - easyPDF Cloud. With all the other conversion products out there, one might ask, why easyPDF Cloud? easyPDF Cloud has a lot of cool and useful features to offer. With its sleek and touch-friendly web-interface, easyPDF Cloud allows you to convert your documents in the cloud, without downloading or installing any program. It is especially handy if you are always on the go or don't need to do conversions on a daily basis. 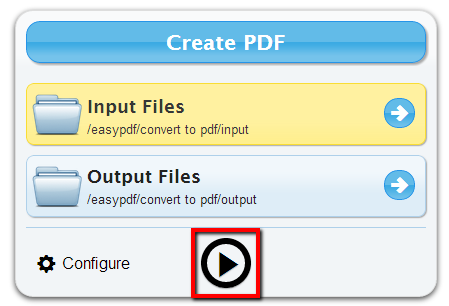 easyPDF Cloud also allows you to convert more than one file at a time and support most document file formats. In addition to all these great features, easyPDF Cloud can be integrated with Dropbox so that you can quickly convert and share PDF or other converted documents with your colleagues, clients or classmates! 2) After you login, click on "Input Files" and then add the files to be converted to PDF. In short, our easyPDF Cloud is quick, powerful and super easy to use. Even more good news, easyPDF Cloud is free! So why wait? Create an account today and be among the first to try easyPDF Cloud!